Intradermal Pigmentation is a revolutionary method of applying micro insertions of natural pigments into the dermal layer of the skin. 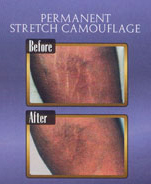 This state of the art technique is medically proven and specifically designed to be completely safe. Intradermal Pigmentation is used for a variety of permanent cosmetic enhancements such as permanent eyebrows, eye liner and lip liner/color. Other permanent cosmetic procedures include vitiligo, stretchmark, and scar camouflage, areola restoration, hairline enhancement and more. The Intradermal Pigmentation procedure for lip color is beautiful. It can appear to change the size and shape of the lips as well as the color. This procedure helps prevent lipstick from bleeding into the surrounding skin. A soft pink, similar to the lip color of a newborn baby, is popular for those wanting a natural look. A more dramatic color can achieved if desired.